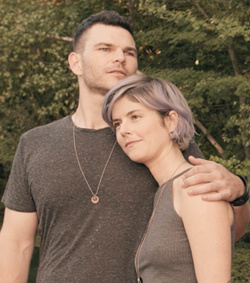 Amazing writing, directing, and acting team Jennifer Allcott and Josh Helman are here with their poignant and gripping film, Kate Can’t Swim about the complexities of love, relationships, and forging ahead with renewed spirit. AIFF - What was the most challenging scene emotionally and how did you work through it? Josh and Jen - The most challenging scene emotionally was probably the break-up scene. It’s a really challenging scene for any actor, not only emotionally, but especially considering the improvisational nature of the film - it’s not easy to go deeply into a break-up scene without specific words to work with. We were fortunate to have worked on that scene in rehearsals, though, and doubly fortunate to have had the actors we did - not only could they handle the improvisation, they could handle the dexterity of moving from beat to beat through the scene while never losing their connection to their characters’ emotional lives. We shot two takes that ran almost 15 minutes each. At the end of the second take there was a group of about six of us, huddled in the next room around the tiny monitor, crying. We thought that was probably a good sign that we got it. AIFF - As a writing team and or directing team, were there elements of the film that you absolutely felt needed to be there, and if you disagreed how you did ultimately resolve the issues? Josh and Jen - What we found worked for us was to lock ourselves in a room and go back and forth through each beat. One of Jen’s great strengths is a real handle on emotional texture and emotional logic, and one of my particular strengths is structure and unity. So together we found that the best way of doing things was to build it together so that we were both happy and felt our particular ways were honored. We always knew that the film had to be in Kate’s perspective at the beginning, but that at the midpoint we would (hopefully) divorce ourselves from her perspective as her nuances and the other characters’ nuances come to light, which we felt would allow us to see every one of the four characters in an increasingly different light, so that by the end you were surprised by every one of them. That was key to us. AIFF - What would you hope your female audience takes away from the film? Josh and Jen - We hope that the film feels truthful to everyone who sees it, male and female alike. It was very important to me that the depiction of the relationships be realistic and naturalistic and not tethered to any traditional notion. Jen and I are committed to writing roles that are complex, interesting and human - particularly our roles for women. We’re often irritated by how women are portrayed in media, and as actors we have seen the inner workings of that firsthand. To study the casting breakdowns for female roles can be a maddening and sad experience. As a director, all I want to do is be able to tell a truthful, engaging and hopefully moving story and never lose sight of my own particular biases in the process. And on a personal note, I am white and male and as such I can never fully know the ins and outs of being female or a minority but if I’m going to be a part of that conversation then I want to listen and learn and make sure that my part in it adds to the conversation instead of subtracting from it or muddying it. AIFF - How did your lakeside location set the tone of the film? Josh and Jen - I think it helped in a few ways - it was an effective misdirection for us in cinematic terms, because cabins in the woods tend to be places where young people die - and we wanted to use that to our advantage in getting our first impressions of Nick. But also it is a place that suggests a kind of timelessness - especially that particular location - and what I think that does is allow us to subconsciously feel the time passing in these characters’ lives - these people will inevitably change as sure as the cabin and these woods will remain. And finally it was just helpful to emphasize different aspects of the woods and the cabin when we needed to feel claustrophobia, remoteness, and finally a reawakening.